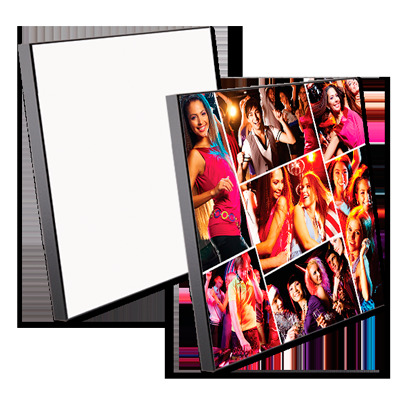 ChromaLuxe™ MDF Wall Photo Panels feature an advanced, highly durable and extremely smooth UV resistant coating bonded to 15mm MDF plaques equipped with keyholes for vertical or horizontal mounting. They have a black 5/8” thick finished edge that is ready to hang without framing. Images are infused directly into specially coated wood panels with a scratch resistant finish, making them durable and long-lasting. Sturdy and lushly coated, these plaques are perfect for any photograph. Remove protective film before pressing. Secure the transfer to the back of the product with heat tape before pressing. Always use protective paper above and below the product you are pressing to protect your heat press from stray ink. If you see a bend in the panel after cooling, place back in th press imge face down and press for 30 secs.